Bridges are made of metal and porcelain or sometimes just porcelain. The colour of the bridge teeth can be matched to the colour of your own teeth. 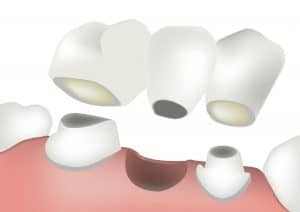 The teeth that will support the bridge are prepared in a similar way to preparing a tooth for a crown. An impression of the teeth and any gaps is taken, and the dental technician uses this to make the bridge. A plastic temporary bridge or temporary crown may be fitted in the meantime. At your final visit, the dentist will check that the bridge fits and then cement it permanently in place.